Luxurious, tactile sensation that inspires age-old love and romance. Our flocked velvet vow books are delicate pieces of artwork, with its own natural imperfections, which makes each book truly unique. Hand-made to order in our North Carolina studio by the Wedding Story Writer team, each vow book presses for a minimum of two weeks to ensure your heirloom is properly pressed. Available in a variety of colors, these vow books are sure to please you and your future spouse, your photographer and your future family. 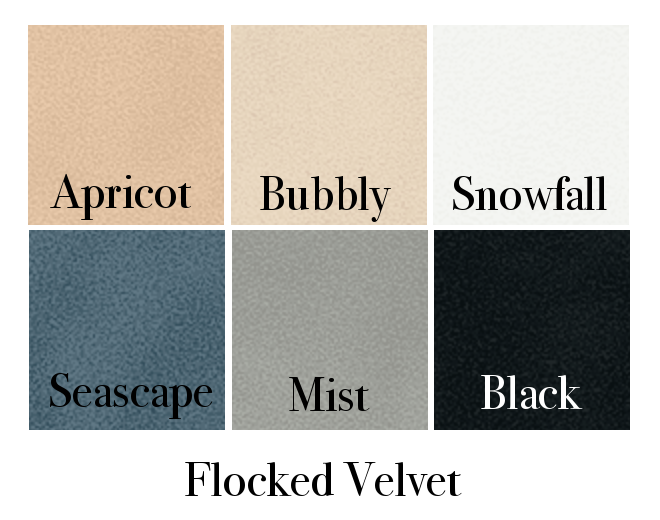 Care: Flocked velvet is a sensual, yet delicate fabric. It mars easily, so you want to be sure to treat it with care. Do not place items heavier than a piece of paper on this fabric. Keep in a dry, dust-free and humidity-free area, away from heat and light. Do not bend your vow book backward as it may crack the spine. Store in a Wedding Story Writer book box for ultimate care. Colors may vary due to lot changes, computer monitors and sunlight/shading. 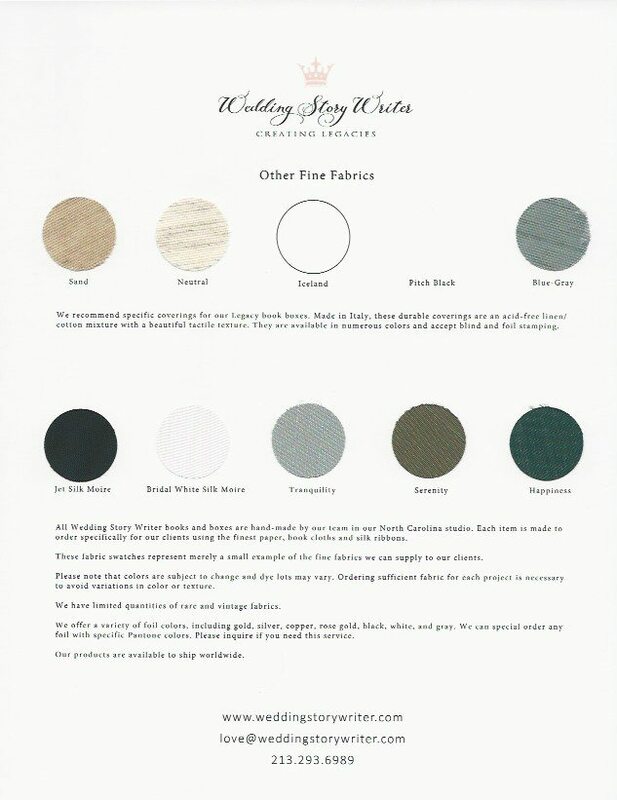 If unsure about a color, please ask us specific questions before you order. You may also purchase a swatch sample or download the PDF below. 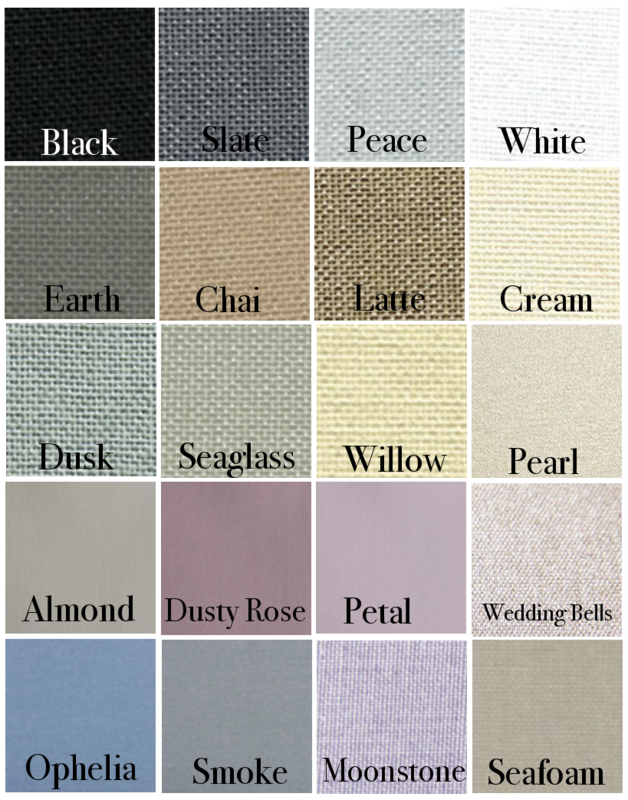 A fresh, classic book cloth used for centuries, linen inspires romance and classic elegance. Our linen books are timeless piece of artwork, each hand-made to order in our North Carolina studio by the Wedding Story Writer team. Each vow book presses for a minimum of two weeks to ensure your heirloom is properly pressed. Available in a variety of colors, these vow books are sure to please you and your future spouse, your photographer and your future family. Our linen books are perfect for chic, sophisticated urban couples with a love of travel and minimalism. Care: Please handle with clean hands, as linen is very susceptible to oils and makeup. Keep in a dry, dust-free and humidity-free area, away from heat and light. Do not bend your vow book backward as it may crack the spine. Store in a Wedding Story Writer book box for ultimate care. Traditional, light-catching taffeta book cloth has a crisply textured appearance. It is quite elegant and traditional in every sense, mimicking ball gown or bridal gown fabric on a high-end scale. We recommend using a metallic foil to compliment any vow book made with this rich fabric. Our taffeta vow books are timeless piece of artwork, each hand-made to order in our North Carolina studio by the Wedding Story Writer team. Each vow book presses for a minimum of two weeks to ensure your heirloom is properly pressed. Available in a variety of colors, these vow books are sure to please you and your future spouse, your photographer and your future family. Our taffeta vow books are perfect for upscale, large weddings with glamour and elegance being a top priority. Care: Keep in a dry, dust-free and humidity-free area, away from heat and light. Do not bend your vow book backward as it may crack the spine. Store in a Wedding Story Writer book box for ultimate care. Please inquire about silk vow books, as these are available by custom order only. Traditionally and practically, book boxes should be created with sturdy, hearty Italian book cloth. We chose three specific high quality, durable book cloths that we feel will stand the test of time. Please allow a minimum of 8 weeks for creation and delivery. Rush orders are available for an additional cost. Colors may vary due to lot dye changes, computer monitors and sunlight/shading. If unsure about a color, please ask us specific questions before you order. You may also purchase a swatch sample or download our PDF below. Custom colors available. Please inquire via our contact form.